Looking south from the summit of Grandeur Peak. January, 2013. 3/3/2013 : I finished 12 laps in 23 hrs 10 minutes! More details soon… after I sleep. 3/2/2013 : Follow me via SPOT tracker here. 3/1/2013 : Tomorrow is going to be incredible! With a high of nearly 50F, a low of 38F in SLC, and a yellow “Air Action” alert, we will both have a beautiful day but also be reminded why we’re doing this with every lap. It’s amazing to think that if everyone listed below meets their goal, Grandeur will see over 100 summits, on March 2nd, via the West Side; that has likely never happened before. See y’all tomorrow. If you’re like me, you LOVE living in Salt Lake City. Nestled closely up against the Wasatch Mountains, this amazing place offers a brilliant combination of city living and rugged mountain lifestyle. Most folks take one or the other while some indulge in both. I’m one of those lucky people who has an incredibly satisfying career and a magnetic connection with the mountains. Thankfully our geography facilitates both. There is one downside, however, which is that the core of the Salt Lake City metropolitan area is located in the bottom of what was once was Lake Bonneville. Couple this with winter thermal inversions and a society that hasn’t yet figured out how to change its behavior in spite of our unique challenges, and we often have extremely unhealthy air. As such, most evenings after work, I find myself literally Running Up For Air. Me in 2012 on my 3rd summit of the day. Building on my 2012 awareness campaign, it’s time to do it again! 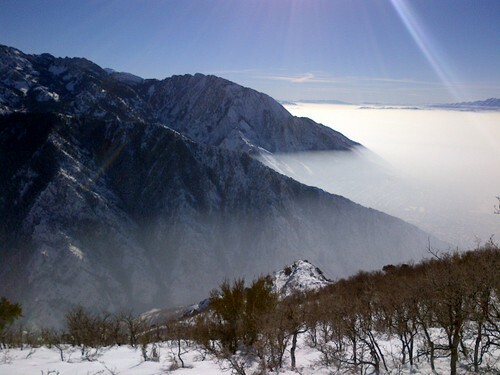 Partnered with Breathe Utah, my goal is to get as many folks as possible to come join me on the west side of Grandeur peak on March 2nd, 2013. This is not an organized race. There is no entry fee, no t-shirt, no finisher medal, and no provided supplies. You need to come prepared to take care of yourself, just like you would if you ascended the peak on any other day. What I am hoping for is that anyone who values breathing come participate in some fashion. The west side of Grandeur Peak is remarkably steep, climbing 3,300′ of vertical gain in just over 2 miles. 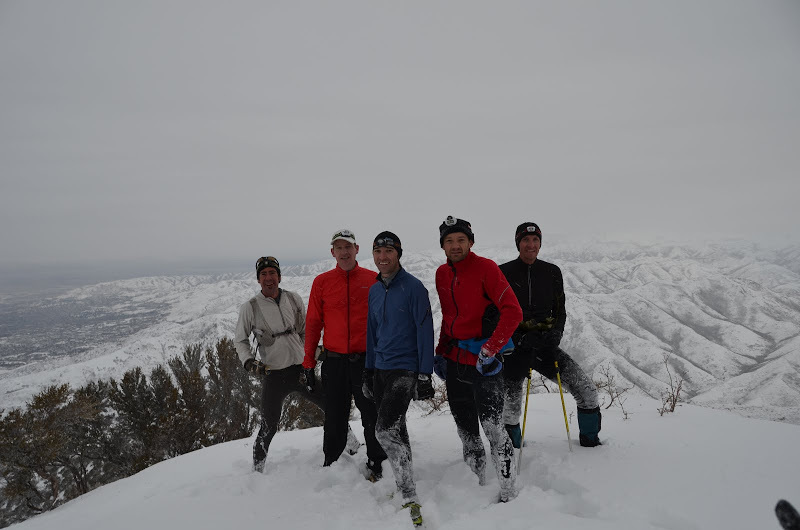 Winter conditions also make it MUCH harder than when the trail is dry. So, don’t say I didn’t warn you, this is really tough! Ask yourself what the most challenging, but reasonable, goal could be on March 2nd. Then add 25%! With enough of us out there the group energy and motivation will enable us to all do things that might normally seem impossible. This is a beautiful analogy for what we need to do, collectively, as citizens of this city to prevent the “red air” events that have so many folks grabbing for inhalers. Once you’ve determined an applicable goal, spread the word. Talk to everyone about it, and ask them to support you. If your personal challenge has you making multiple ascents of the peak, consider raising money for each summit and/or your overall goal. Make your donation directly to Breathe Utah, an incredible local non-profit whose staff works tirelessly for the benefit of all of us (use this link to donate if you’re so inclined). Local aerobic respiration enthusiasts on lap 1, March 3rd, 2012. Given the impressive number of folks who plan to participate on Saturday, the small trailhead parking lot will quickly fill up. The best recommendation is to park at the Eastwood elementary and walk north along Wasatch Blvd to the trailhead. See this map. My personal goal this year is to go for summit 12 times in 24 hrs (~40,000′ of elevation gain in 24 hrs). Can I do it? I’m not really sure, but I’m sure going to give it all I’ve got! If the conditions are anything like last year, it’ll be near impossible. If you’d rather not get cold and wet, but still want to participate, consider financially backing me (or someone else) by offering a challenge grant. Shoot me an email (jared.e.campbell [at] gmail [dot] com) if you want to participate and I’ll add your name below. Start time is up to you! I’m really looking forward to a day of strong group energy, folks accomplishing the impossible, and raising financial support for something really meaningful. So it took me two separate days on Grandeur to knock out my five summit goal, but after two laps with the group in early March I added three more this past Saturday and thus completed my original goal (2 + 3 = 5, doesn’t it? DOESN’T IT!?). In stark contrast to my lackluster effort, my donors blew our $50 goal out of the water — I just donated my accumulated pledges, which totaled over $330! Thanks for organizing this fun and worthwhile event Jared. I think you’re at the Barkley right now so I hope that is… well, whatever that is. Wow, that’s fantastic! Thanks Dan and congrats. Tawny is now up to $200 (+Grey Poupon bonus?) per summit. Which means I am commited to at least 5 summits, otherwise I will never hear the end of it. Im in for 4 summits. Jared, sorry the late response. I’d like to commit $100 dollars to the cause, and join you for a few summits. I’ll park at the school, and I understand the “non event” nature of this effort. Thanks, Quintin. Fantastic! I look forward to seeing you out there Quintin. Wow, I can’t wait to hear the story behind that! Thanks for all your support Dan. Hi Jared — We met at El Chihuahua the other night. Thanks for organizing this cool event. I’m in for five summits and a financial contribution of at least $50. See you at 6AM on Saturday! Awesome Mike, I’ve got you down for 3. WOW – What a wonderful vision. I will be in Arizona that weekend, however, I will be with you in spirit. AZ has its own air quality problems. Your challenge has inspired me to find a summit of my own. Thanks so much Jared. what time are you starting? Put me down for a goal of 6 hrs and/or hopefully 3 laps! I’ll post my goal on facebook and see if I can get some donors. I’ll be planning on making a personal contribution too.